Snow! What having an over abundance of snow means for your home and what you should do about it. - Scarsdale Premier Insurance Agency | Advocate Brokerage Corp. Snow! What having an over abundance of snow means for your home and what you should do about it. Snow, we’ve definitely got snow and plenty of it. With the record breaking temperatures we’ve been experiencing, the snow we have is sticking around. It just hasn’t been warm enough for it to melt, which is both good and bad. Un-melted snow brings with it two issues, aside from it being just plain unsightly: the stress it can bring to your roof and the potential for flooding. How much is too much snow? Snow capped roof tops may look pretty but when snow sits upon your roof top for an extended period of time, it can add stress that can lead to structural damage. 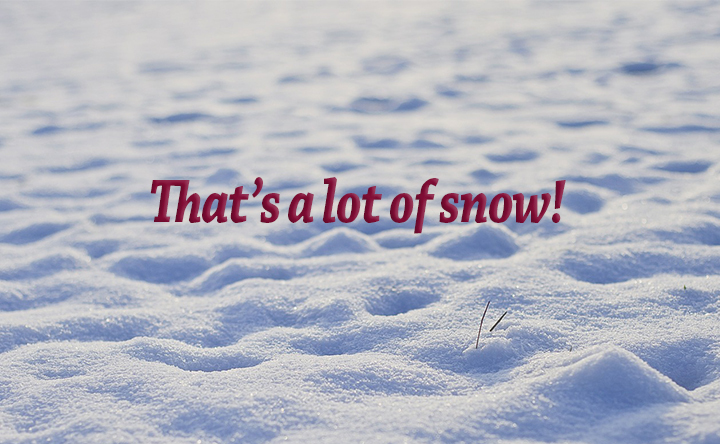 2 feet of snow can add 150,000lbs of stress to your roof, enough to cause a collapse or leak. Advice from your Advocate – Look for signs of a stressed out roof. If you have sagging ceiling tiles, jammed windows and doors or roof leaks, you might have a problem. If you have a roof rake and can safely remove it, it might be worth giving it a try. If you are unable to or feel it is unsafe, contact a professional to remove it for you. What is going to happen when all this snow melts? I mean it has to go somewhere. Once the temperatures begin to rise and stay above freezing for an extended period, the snow is going to melt. If you do not have proper drainage the excess moisture could cause structural damage to your home. Advice from your Advocate – Even if you do not live in a flood prone area, consider flood insurance. Most policies will not cover losses that occur within the first 30 days of coverage so you will need to act now while it is still frozen! PS. There is more snow in the forecast for this week.